The show kept me for three days this year, and was certainly one of the more pleasant ones I have been to. After the past few years of my coming up to the manufacturer’s stands and asking for English language press kits, they have finally begun to respond and more than 50% had them this year. I fully realise that this is Thailand, but it is an “International” Motor Show, and being the second largest motor show in Asia (Tokyo is slightly larger) and attracting foreign journalists, English language should be offered. One car that has really started to grab my attention is the MINI Cooper. I have had more than a couple of the original Mini’s over the years and it may be nostalgia, but I reckon they look great, and in the tin, even better. They are actually much larger than they look in photographs, and very much larger than the original ones, yet they have captured that ‘retro’ look perfectly. 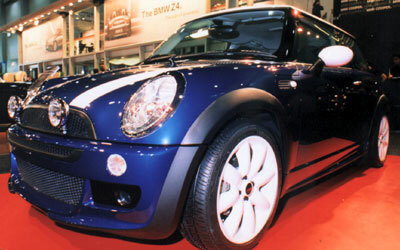 In this country the range begins at 2.2 million baht for the MINI Cooper Look 1, up to the Look 4 at 2,449,000 baht. These all have the 1.6 litre naturally aspirated engine, developing 115 BHP (85 kW) at 6,000 RPM. Top speed is quoted as 200 kph and the 0-100 clicks comes up in 9.2 seconds, so it’s not exactly a fireball. The ‘cooking’ model also comes with automatic CVT (continuously variable transmission) with Steptronic. The MINI Cooper S still has the 16 valve 1.6 litre engine, but gets a supercharger to lift the power output to 163 BHP (120 kW) and lift the top speed to 218 kph and lower the 0-100 times to a healthier 7.4 seconds. Transmission in this case is through a 6 speed Getrag manual gearbox. To stick one of these little jiggers in the garage will set you back 2.6 million, or 2.7 fully loaded, as they say in the trade. I want one. One vehicle that did not set my hormones working overtime was the new offering from GM, being produced at the Rayong facility. 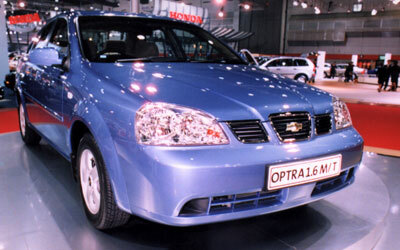 Called the Chevrolet Optra, this is the Daewoo Lacetti by another name and the South Korean origins are too obvious, with that characteristic gawdawful styling. It also looks old fashioned. Compare it to the Mazda Prot้g้, which has been around for a couple of seasons, for example. 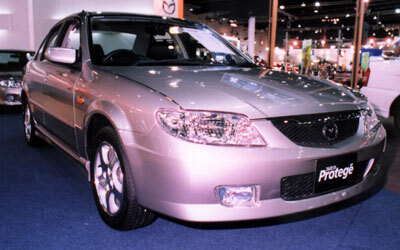 The blurb claims that it was a styling joint cooperation between Pininfarina and Daewoo Design. Looks to me like the Italians got the rear vision mirrors and the Koreans got the rest. Known as the Lacetti in Korea, the name is apparently derived from the Latin word “Lacertus,” which means “energetic, muscular, youthful, and full of strength”, but for my money I think it is derived from Olivetti, having all the aerodynamic styling of a typewriter. However, it may be a great car. I shall leave the final judgement till I’ve driven one. 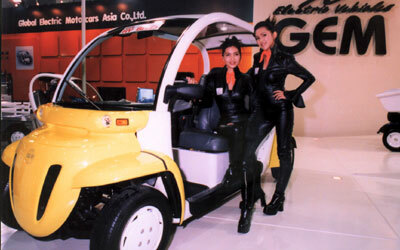 There is a definite ‘push’ towards electric vehicles and the ‘prettiest’ ones there came from the Gem people, G-E-M standing for Global Electric Motorcars. These work on a basic ‘cab’ with different body styles from the front seats backwards. These include a short tray pick-up and long tray pick-ups, 2 passenger cars and 4 passenger vehicles. The power supply is from 6 x 12 volt rechargeable batteries and it is claimed that the lekky motor will propel the 500-800 kg vehicle (depends upon configuration) at 40 kph for a range of 70 kays. Price? Ah yes, there’s always a downside, isn’t there. For the two person configuration they retail at 395,000 baht, up to 550,000 baht for the long tray pick-up. However, if you are into saving (what’s left of) the planet, this could be worthwhile looking at. Now if your pockets aren’t deep enough to hold 395,000 baht (or if you’ve got short arms) and still want lekky power, my mad mate Paul Markham showed me some great little bikes at the show. These are really popular, with Paul getting over 90 orders in the first week. Again these come in all shapes and sizes, but the ‘motorcycle’ one, called the Storm, has been storming out the doors at 14,900 baht. Regular readers will be aware that I have a soft spot for the lekky bikes, using one every Jesters Charity Bike Ride, and even keep a little Honda Raccoon electric bike for small errands. Well, that was before my lady friend appropriated it as being the ideal mode of transport to go to the shops and the markets. 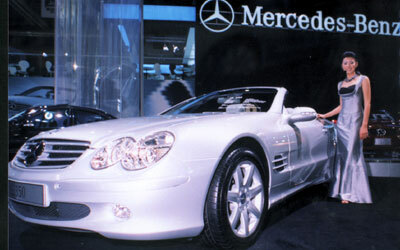 I must also admit to making an error in last week’s column, where I called the M-B 350 convertible, a 280. Here is the photo to prove just how wrong I could be. I claim old age and free booze as the culprits. Last week I mentioned a very famous aristocratic German was one of the famous pre-WWII Mercedes aces. He was present at the release of the Mercedes-McLaren a few years back. He died this year and I asked who was he? It was Manfred von Brauchitsch, who was well into his 90’s when he made his last pit stop. So now to this week. Another of the great Mercedes team members was Alfred Neubauer, team manager both pre and post WWII. He is credited with having invented pit signalling boards. What prompted this? Here’s a bit of froth and bubble. A few weeks back I asked about the Hindustand Ambassador vehicles (re-makes of the old Morry Oxford) and I received this very amusing letter from K-H Behme, an ex-owner, who now lives in Chiang Mai. I had one Ambassador during my time in New Delhi, India from 1980 until 1987 and I drove it for almost 100,000 km. There was a saying, that the good part of the Ambassador was that it can be repaired in any workshop, the dark side was, that it had to be repaired in any workshop. 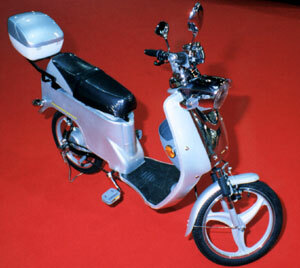 The Ambassador came in 1980 in several colours, not only in white. It was a 4-seater, which was able to carry up to 10 Indians [Indians only] in comfort over long distances. Rumour had it that it was still manufactured on machines imported as obsolete in 1959 from Morris Oxford. When you opened the bonnet the first (thing) you saw was the street, then you could make out a small 4-cylinder engine, a water pump, a generator and a starter. There was no ventilation system except the little triangle windows after the A-pillar, like in a VW beetle. But naturally they only worked while speeding. In New Delhi there were already traffic jams during office hours at that time and in May/June the temperature soars up to 45 centigrades. Max. speed was about 95 kmh, which you reached after several minutes of undisturbed driving. When Indira Gandhi was assassinated and her son came to power, he also drove an Ambassador but gossip had it that this car was handmade, slightly bigger, armoured and had a Porsche-engine.